Marion Cochrane. Photo kindly provided by Colin Nicol. 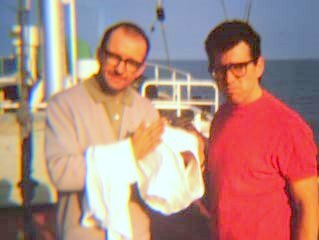 When Richard Curtis's The Boat That Rocked was released, one of the many criticisms levelled at the film was that the storyline included a female member of the ship's crew - something that the critics said never happened in the sixties. But Curtis was more accurate than people thought. 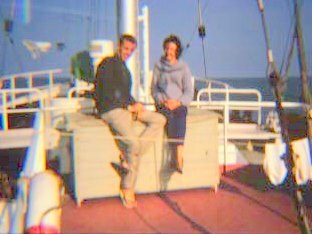 Radio Caroline South did have women aboard on a regular basis during 1964 and '65. Australian Marion Adamson (née Cochrane) was one of them and has very kindly written about her time with Caroline for The Pirate Radio Hall of Fame. She has also sent some photos. Although they are not all brilliant quality, they provide a fascinating insight into everyday life on board the radio ship. 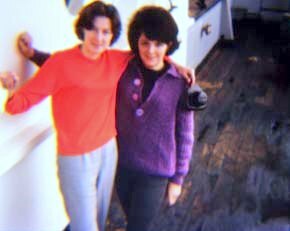 Marion writes “sorry about some of these photos but they are 45 years old and taken off slides”. We are very grateful to her for sharing them with us and for telling her story. “I worked in Sydney radio from the age of 19 as personal assistant to Bob Rogers and Tony Withers (a.k.a Tony Windsor in the UK) at Radio 2UE for three years. I then joined 2SM Sydney to run their Record Library and assist the Programme Director John Brennan. During this time the station changed format to 24 hours rock and shot to No.1 in the ratings, holding that position for 2 to 3 years. The ‘Good Guys’ concept was introduced during this time and the station was well consolidated as the top rock station. In 1963 I decided to travel to the UK with some friends to see the world. I left with loads of contacts from the music industry and as we arrived on English shores just prior to Christmas I took a job offered to me at Peter Gormley's office (Cliff Richard's management team) answering Cliff's fan mail. In the New Year one of the music publishers got back to me and told me about Allan Crawford's project of offshore radio (Radio Atlanta). We met and I started at his office in Dean Street in early January 1964. Mr. Crawford was recruiting Australians who had worked in commercial radio and as I was one of only two girls in the UK at the time who had programmed a rock station, I was warmly welcomed. 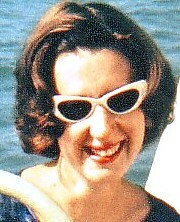 The other girl was Dorothy Wight of Radio 2GB in Sydney. She joined too. It was difficult programming as the lack of material was dreadful. We were doing ‘rehearsal tapes’. We had to beg, borrow, buy or steal any records that came our way. After we started broadcasting and the two companies (Atlanta and Caroline) merged making up Caroline South and North, things became easier with everyone clamouring to have their records aired. It was decided to send ‘the girls’ to the ship (Caroline South) on a regular basis to keep the DJs up to date on format, core play lists and general information coming through Head Office. The captain wasn't too pleased at this idea, but after some reassurance that we were there on a strictly business basis, he relented and allowed just three of us on board. The third was English girl Maureen Blackburn who had worked at the BBC in the office and was looking for something a little more exciting. 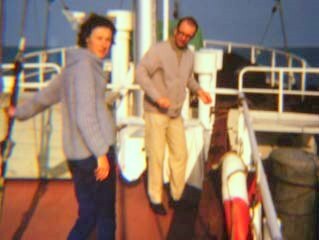 We would usually go out in pairs, spending four or five days on board, helping with the programming, cataloguing, generally sorting things out and making sure all was complete with the playlists and format. Then we would spend two weeks at Caroline House getting things ready again. Dorothy and I could see the station had to consolidate a true pop format with something to hinge it all together, so we suggested to Allan Crawford and Ronan O'Rahilly we adopt the 2SM format and the 2SM Good Guys. They agreed, so began the Caroline Good Guys. Mike Walsh from 2SM came to London and ran a promotion with them. It was successful and many on shore events took place with that theme. As far as life on board was concerned, it was great. The DJs were wonderful to us all, we had great accommodation, a happy place to work and a very exciting time in introducing the fun and spontaneity of good commercial radio into the UK. I don't think any of us ever realised at the time what an influence Caroline had on the music industry and emerging artists and bands of the day. We did experience some hairy times going out to the ship. One time in particular was when Head Office asked the ship to move seventeen miles further out to sea in the hope that it would provide better reception in London. What they didn't factor in was a Force 8 gale. It took the tender five hours to find the ship, then it was impossible to pull alongside. 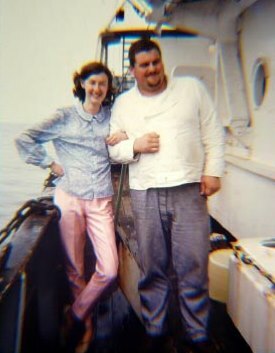 Maureen and I pleaded with the captain of the tender to try again, and we finally made it when he picked me up and threw me across to the Mi Amigo where one of the crew caught me. The same happened to Maureen. 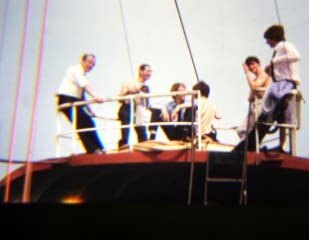 We spent about a week on board in awful conditions with the mast catching fire, the ship rolling, the DJs being seasick and all the gear on the floor. We finally sailed back to our old spot and the calm seas returned. 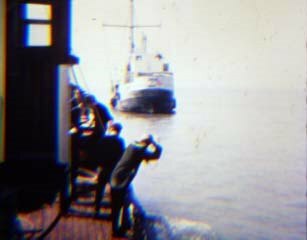 Boarding the tender at Harwich pier. Programme Director Ken Evans and Marion Cochrane. DJ Bryan Vaughan and the crew. 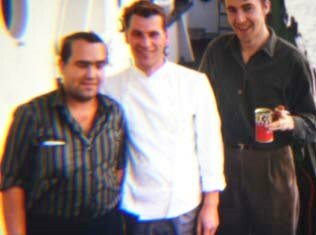 Marion and Arnold, the Dutch chef. Ken Evans and Mike Allen on laundry day. DJ Simon Dee and Marion. 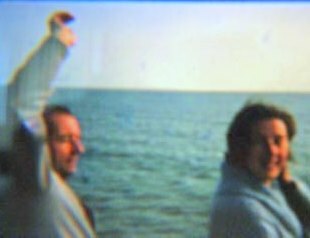 Ken Evans and Marion on a boat that rocked! Pop group The Paramounts visiting the Mi Amigo. 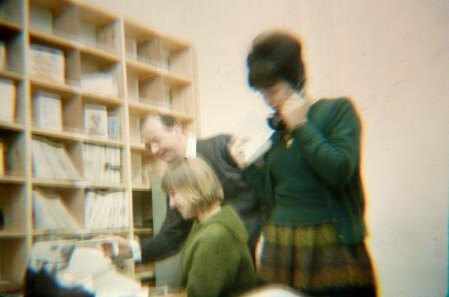 Ken Evans, Maureen Blackburn and Dorothy Wight in the library at Caroline House. We are very grateful to Marion for writing and for providing the photos, to Bryan Vaughan for putting us in touch and to Colin Nicol for his assistance. Sadly, since this page was compiled, Marion has died. Our tribute to her is here.